All men's tungsten rings prefixed TURM now have a 2 year manufacturers guarantee. 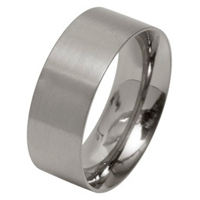 A men's traditional 6mm flat ring made from scratch resistant tungsten carbide. The "Tungsten Carbide" wording in this ring has been designed to allow more room for the engraving of longer messages compared to our other designs. Although our other designs can be engraved with up to 20 characters this ring can happily accommodate 25 characters on the smaller sizes and 30 on the larger.